Have you ever had a movie that you remember adoring, then when you watch it again, you find yourself looking at the movie in a completely different light? Well I call this a “Be Kind; Rewind” kind of movie. I enjoy watching movies I haven’t watched in at least a year (usually more) and comparing what I remember of it, to what I thought about it immediately after watching. I was obsessed with this movie when I was younger. It was my Heath Ledger phase where I would literally watch this movie and 10 Things I Hate About You on repeat during the summer. . I remember the jousting, the dancing and Alan Tudyk. But I’m pretty sure the main reason I watched it was for Heath Ledger. There is little else that sticks out in my mind as a plot point or great character moment. I’ve recently been watching Galavant and as I watched it kept making me want to try this movie again. It has been far too long since I’ve seen it. 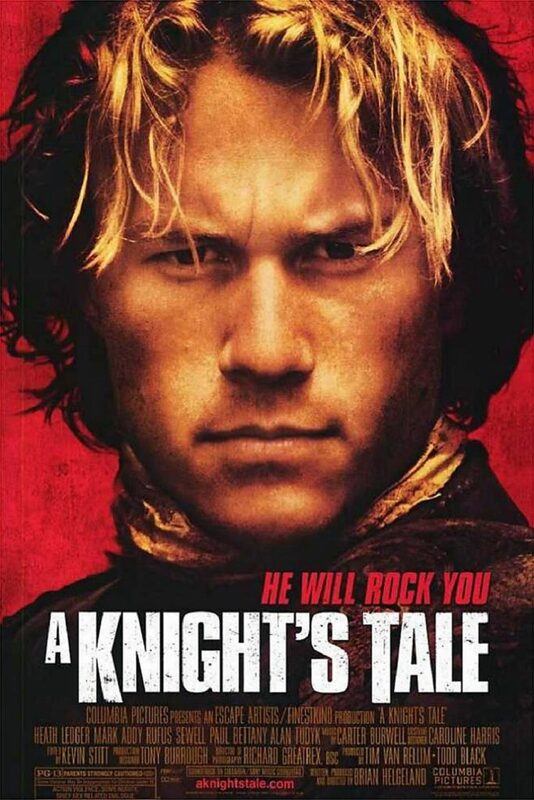 First and main thoughts: Man, I miss Heath Ledger. *sigh* As I watched this again, I realize the amazing casting decisions that went into this movie, and how I couldn’t fully appreciate it until now. Not just Heath and his skills at making a girl swoon with smirk. But also Alan Tudyk (whom I only really began to adore after seeing Firefly), Paul Bettany (Jarvis in the flesh) and even Mark Addy (from a squire to King Robert Baratheon in GoT). Onto the rest! I’m not sure how I could forget that “We Will Rock You” by Queen is at the beginning. This sparked a love of classic rock the year it came out for me. Particularly because I had never really grown up with any classic rock and We Will Rock You is still one of my favorite songs to get me pumped. In addition to the opening song, I never really paid attention to how awesome the soundtrack to this movie was. Some really great music that makes you want to dance. There are a few quotes that really stand out to me, but one that struck me as the most meaningful and one that I could use to hear in daily life is “A Man Can Change His Stars.” For some reason, this quote never hit so close until now. A saying that inspires you to go for what you want and how you want it, to never give up. And William never did. Paul Bettany plays Geoffrey Chaucer. CHAUCER. HOW DID I NEVER NOTICE THIS?!?!? Yes, it’s a fictionalized version of Chaucer. But I don’t know that I ever really listened for his name as I was distracted at the time with Paul/Chaucer trudging past the main characters sans clothing. I remember thinking that Alan Tudyk’s character Watt (so close to Wash, I want to cry), was so funny. But in the rewatch, I found myself laughing more at Paul Bettany, than Watt. As much as I did enjoy it, I think I enjoyed it more when I was younger. I did find myself pointing out historical inaccuracies (buzz kill, I know) and getting easily distracted. It’s still good, but didn’t hold my attention like it did when I was younger. It would be nice to see this on a regular basis. Maybe have it playing in the background while I do dishes or cook dinner. But, that might be more for the soundtrack than the movie. What movies have you watched recently that you forgot about?